Dell has officially announced an updated version of its Latitude tablet edition which is called as Latitude XT2. Latitude XT2 offers 12.1 inch with 1,280 x 800 capacitive touchscreen and features a relatively powerful Core 2 Duo ULV processor running at either 1.2 or 1.4 GHz. Beside that, the CPU also integrated with Intel GMA 4500MHD graphics and supports up to 5GB of DDR3 memory. Up to 11 hours, 28 minutes of battery life1 with six cell battery and optional 6-cell battery slice. Comprehensive services options with Dell ProSupport.2. Improved connectivity with new LCD-based wireless antenna design. Daylight Viewable display that has up to 100 percent more luminance than the HP EliteBook 2730p. Full-size keyboard, touchpad, point stick and battery-free pen give users input flexibility. Combines performance with high touch accuracy to allow touch interface with small icons without drops or hangs. Enhanced hinge design for improved panel stability. SATA drive support providing updated storage technology and enhanced performance. Comprehensive security features adding Dell ControlVault and ControlPoint Security Manager. DDR3 RAM allows better performance and up to 5GB RAM3. Manageability with integration of Intel vPro and DASH 1.0 compliance. 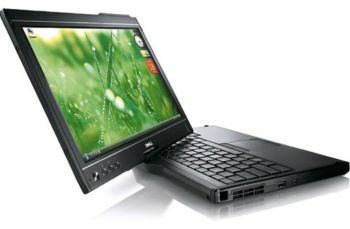 Currently, it is available for start order at dell website with the price start at $2,399.